THOMAS EDISON LOVED TO SHOW OFF HIS LABORATORY. Photo courtesy of Wikimedia Commons. Is joy possible in our high-tech future? Not long after the Civil War, Thomas Edison set up the first industrial research lab in Menlo Park—pushing himself and his staff hard to reinvent the way power and information spread across America. Certainly, most of his patents were highly technical—but his researchers also helped to pioneer sound recording and motion pictures. Can you imagine our past century without multi-media? 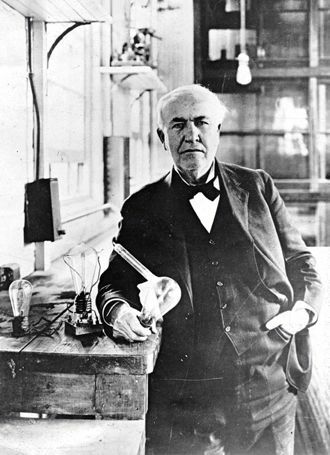 Edison understood both hard-headed business—and the power of marketing sheer joy. Not far from my own office, today, there is a software company that borrowed the name of Edison’s lab and some of his ideas about building our next array of electronic experiences. Menlo Innovations has no cubicles, no minions pounding on keyboards and no vanilla walls with corporate icons. Rich Sheridan, one of the founders, is determined to prove the business value of joy—even in an industry that seems joyless. Menlo also is taking the leap from designing functional software to designing software that is a joy to use! And, a joy to design. They begin their process with what they call High Tech Anthropology®. They take on the role of anthropologists and observe potential end users in their “native environment.” Sound strange? They are committed to understanding users and their needs before they start the design work. They have the self-stated goal: to end human suffering in the world as it relates to technology™. A decade ago, Apple shifted its thinking from the electronic thing (e.g. cell phone, computer, DVR, etc.) to the thing-using experience. This was also a joy-related leap in thinking. It was so radical most if its competitors still haven’t figured it out. Apple started with how the customer experiences every step of their experience; from purchasing, to box-opening, to turning on, to using, to updating, to getting help. If you own an Apple product you know this. Joe Pine and Kim Korn point out in their book, Infinite Possibility: Creating Customer Value on the Digital Frontier , that today most digital technologies are tacked on, and in fact often worsen the experience. Just think of airport or hotel check-in kiosks where you fear losing your reservation instead of accomplishing your task. They challenge businesses to explore what the old mapmakers referred to as terra incognita: unknown land.